Jar With Most offers up more memories of Flint in the seventies. 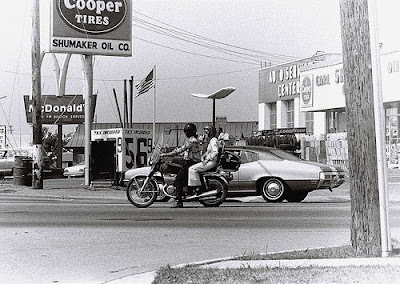 Here's the corner of Miller & Ballenger, circa 1977.
it would be awesome to see a photo of that corner today... or perhaps awesome is too strong of a word. I'll see if I can snap one for you Anony. I'm flying into Bishop International tomorrow and headed to Port Huron for the weekend. I love Bishop so much way better than Metro! Oh, I just remembered...I'll be getting in after the street lights come on. Nevertheless, I'll probably do one of my "nostalgia tours" before escaping back to Georgia next Monday. I'm taking my camera with me. Y'all pray for me that I make it in and out without anybody noticing. I hear there might be a hefty bounty offered for ExPats found roaming the city. And please pray that I won't get snowed in for the remainder of winter (meaning "until June"). Great shot. Didn't that tire store become Shumaker's Ski Shop? Last I heard the ski shop was still going. actually it doesn't look a lot different other than shumakers is gone and the great divide is there. in the photo the motorcycle is headed south and the ski shop was actually north of the corner attached to the building however. and yes i beleive the ski haus is still in operation. wow if we keep going maybe we will see gas at 56.9 again...yeah right but it is a relief right now. It appears to house "The Great Divide--a UofM-MSU store. For some reason, I thought the ski shop moved out. Could be wrong. I shall see tomorrow, I suppose. Shumaker's Ski Shop appears to still be there. They're probably kicking into high gear about now with the storm that just rolled through yesterday. I worked at that McDonald's one summer. There was an old folks home behind it, and seniors would come in for their 25 cent ice cream cone and coffee. I used to feel sorry for them, so I'd make the biggest cone I could make for them. My manager would berate me for giving them a 75 cent cone for 25 cents, but I played dumb and kept doing it anyways. I went to high school at Ainsworth with Tom Shumaker in the late 60's. Bought my first skis there in 66. What I like about this pic is you can see the long cane fishing poles in the barrel. Shumakers had those out on the corner every summer for as far back as I can remember. Good eye, Jbing. I remember those poles now, but I never would have noticed them in the photo. That corner still looked pretty much the same when I left four years ago. Like someone said, The Great Divide is there now but other than that it's all the same. Look at those gas prices! 56 cents a gallon. Wow. Tons of memories of that corner and Shumakers. My dad worked there for a bit off and on. He had just come home from wok when it caught fire. ...'66 or '67 maybe? We watched from our house on Salisbury until it was safe to go down and see the remains. A bit sad to see but, the rebuild turned out nicely. Hey grumkin, I worked at that McDonalds the summer of '76. We had a flag football team that played other Flint McDs. Lots of fun but yeah, hard work too. Oh, and my cousin worked at the KMart across from Shumakers right after it was built. That was a pretty big thing when the store went in. Wow, what memories. My honorary Grandmother Mary Royal worked for Harvey Shumaker as a bookkeeper in the 1950's. She always said he was a very fine man. yeah, and kittycorner was the Citizens Bank. and down farther was the Unitarian Church. my old man told me they were commies when I was a sprout. Kmart went in and the BEST field for playing in was gone, along with access to swartz creek, a haven back then. I had a similar interview w/Mr. S. also, and it went about the same. The Senior's Home there by McD's was a warzone for us. we'd get up on the top floor, before it was open and still under construction, and heave broken chunks of concrete at each other and at whomever was on the ground. it's a wonder any of us made it to old age. oh, wait...I'm the only one left out of my gang. that just sunk in. bustdup, your old man was right. Those WERE actual commies who attended the Unitarian Church. Not all of 'em, but some. Nothing wrong with being a pinko if you ask me. Wouldn't be surprised if there were a few reds going to service there now. Proabaly a handful of Hamas supporters too. A den of lefties. Methinks they were the oldsters who were doing all of the anti-war protests at the intersection there. Shoot, maybe I'll show up Sunday or Tuesday or whenever the heck they hold mass or whatever they call it... serious as a heart attack.